After a brief two-game series in Japan, the MLB regular season goes into full swing Thursday. As spring training comes to a close, teams are beginning to name their starting rotations. Let’s examine a few noteworthy news items across the league and also dive into a couple of two-start pitchers that could provide plenty of production in Week 2. During the regular season, we’ll have a weekly column every Friday highlighting two-start pitchers to help you maximize production for your fantasy squad. Chris Paddack, San Diego Padres: After adding Eric Hosmer and Manny Machado the last couple of years, the glaring weakness for the Padres is their starting rotation. They have some promising young arms, the best of which is Paddack. He reached Double-A last year, posting a 3.12 xFIP and an 8.8 K/9 across seven starts. 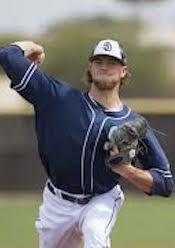 With a chance to open some eyes in spring training, Paddack looked dominant with 20 strikeouts and just two walks across 12 2/3 innings. He pitched so well that the Padres have added him to their rotation. His first big league start will be Sunday against the Giants, which is a cushy spot for his debut. While it’s highly unlikely that he throws a lot of innings this year, Paddack has the potential to be an excellent source for strikeouts for however long he sticks with the big league club. Caleb Smith, Miami Marlins: After the Marlins dismantled their team two winters ago, they entered last year with plenty of question marks in their starting rotation. Previously a member of the Yankees, Smith worked his way into the rotation right out of spring training. He got off to a rough start by allowing 12 runs across 15 2/3 innings over his first four starts, but he settled town to allow two runs or fewer in six of his next seven outings. Strikeouts became his calling card as he finished with an 11.6 percent swinging strike rate and a 10.2 K/9. Unfortunately, his season was cut short in June due to a shoulder injury. Now healthy, he’s shown that same strikeout upside with 19 strikeouts across 13 1/3 innings this spring. He’s also been named to the Marlins’ starting rotation, leaving him as another high-strikeout upside option that could provide value. Domingo German, New York Yankees: The Yankees have certainly dealt with their fair share of injuries this spring. They’ll enter the season without both Luis Severino (shoulder) and C.C. Sabathia (chest/suspension), leaving them short two arms in their starting rotation. One of those spots will be filled by German, who has been named their fourth starter. He also made 21 appearances with the Yankees last year, 14 of which were starts. At first glance, his 5.57 ERA and 1.33 WHIP don’t exactly scream someone to roster in fantasy. However, his 3.94 xFIP was more encouraging, and he did have a 14.9 percent swinging strike rate. With Severino out until at least May, German isn’t someone to sleep on for at least the first month. Among the Yankees opponents to start the season are the Orioles, Tigers, White Sox, Royals and Giants, so the schedule could really lean in his favor. Dakota Hudson, St. Louis Cardinals: The first three pitchers we discussed are all high-strikeout options. That’s not the case with Hudson, who posted just a 7.0 K/9 across 111 2/3 innings at Triple-A last season. During his brief stint with the Cardinals, he only had 19 strikeouts across 27 1/3 innings. However, he’s known for keeping batters inside the ballpark. He didn’t allow a single homer in the majors after giving up just one before being called up. With Carlos Martinez (shoulder) injured and Alex Reyes set to pitch out of the bullpen, Hudson has been named a starter. Even with that spot locked up, his fantasy ceiling will remain low based on his inability to record strikeouts. Mike Clevinger, Cleveland Indians: The Indians enter this season with one of the most talented and deepest rotations in baseball. Clevinger might be their fourth starter, but he could be the ace on many other teams. He threw 200 innings for the first time in his career last year and thrived with a 3.02 ERA and a 1.16 WHIP. His K/9 declined slightly from 2017, but it was still excellent at 9.3. In fact, his o-swing percentage was a career-high 30.4 percent. If you were lucky enough to draft him on your squad, you should start receiving dividends early with him set to start against the White Sox and Blue Jays in Week 2. Chris Archer, Pittsburgh Pirates: Archer didn’t exactly shine as a member of the Rays and Pirates last year, posting a combined 4.31 ERA and 1.38 WHIP. His .338 opponents BABIP and 3.59 xFIP indicates he was a little unlucky, but it marked his third straight season with an ERA over four. Maybe the most concerning number for him last year was seeing his K/9 decrease from 11.1 in 2017 to 9.8. Some of his strikeout issues came with the Rays since he posted a 10.3 K/9 after joining the Pirates. He punched out 18 batters across 11 2/3 innings this spring and will receive two starts right out of the gate. His first matchup will be against a potent Cardinals’ lineup, but his second outing is against the Reds, who are missing a key part of their lineup with Scooter Gennett (groin) out. Despite his issues keeping runner off base, Archer could be a difference maker in the strikeout department with so few two-start pitchers in Week 2 due to off days.